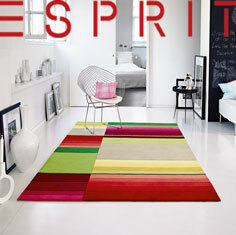 Modern rugs by Esprit, a collection of ultra modern rugs from one of Europe's leading interior design company's. Esprit's contemporary rug collection is handmade in China from chunky super soft acrylic yarn, most rugs in this range are finished with hand-carving and embossing. Brightly coloured dyes combined with bold designs sum up this stunning collection. Please allow up-to 10 days for delivery.